Glial cells (stained in orange) engulfing amyloid plaques (stained in green). Credit: Doug Feinstein. Dr. Douglas Feinstein, professor of anesthesiology, and Dr. Sergey Kalinin, assistant professor of anesthesiology both at the University of Illinois at Chicago College of Medicine, along with other researchers conducted a cell-based study which suggests that alcohol may impede the clearance of amyloid beta in the brain. 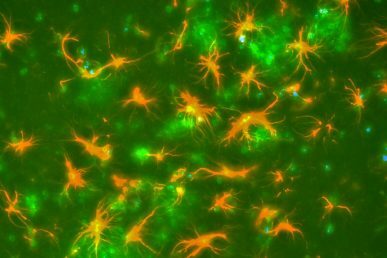 Their results are published in the Journal of Neuroinflammation. Subhash Pandey from the University of Illinois at Chicago and the Jesse Brown VA Medical Center in Chicago; Handojo Kusumo and Sergey Kalinin from the University of Illinois at Chicago; Marta Gonzalez-Prieto and Jose Madrigal from the Complutense University of Madrid; Hannah Scheiblich and Michael Heneka from the University of Bonn, Germany; and Lucia Lisi from Catholic University Medical School, Rome, are co-authors on the paper. This research was supported in part by grant P50AA-022538 from the National Institute on Alcohol Abuse and Alcoholism and a Research Career Scientist award from the Department of Veterans Affairs.